Steve Lloyd and Chris Doran both came second in their sections in the impressive surroundings of the Cunard Building in Liverpool. Steve finished on 7/9, up with the leaders from the start in the Intermediate section. Chris finished on 4/5 in the one-day Sunday Open, conceding just a couple of draws. In the U12 tournament Jack Yang finished on 3/5. The two-day Open was particularly strong with over a third of players being titled. Mike McDonagh started creditably with 2/5 but faded on the final day to finish on 3. Chester players seemed to have the wooden spoon in the bag until the critical round 5 match-up pitted Crocker (0/4) against Lee (0.5/4). Accumulation of some points was inevitable with James finishing on 2.5 and gaining some useful open experience. The chess gods smiled more favourably on your reporter with a 5/5 finish. Dave Robertson attended the opening ceremony and was praised for his accurate memory and attention to detail by the entertaining chess-playing mayor. All-in-all an excellent new tournament which will hopefully be repeated in future years. Now that the new season has finally arrived and the buzz of anticipation at the new [and indeed old] challenges fills the air, let us take a last look back with fond memories of the season just passed. For last season was one of the most memorable in the long history of Chester Chess Club. In the Chester & District Chess League we lifted all four of the trophies on offer; Chester teams were champions of each of the three divisions and also won the Handicap K.O. Tournament. The Wirral League saw us win divisions 3 and 4 and win the Handicap K.O. for a healthy haul of honours. A particular feature of our success was felt to be the “K.O. double” achieved for the first time in the collective memory of the Club. It would be pleasant to be able to echo the tribute paid to the founder of the modern [i.e. 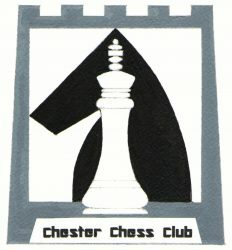 post 1919] Chester Chess Club, Bill Turner, in evaluating our approach. Of him it was said [see upcoming History section of the website for further details]: ” Thus this modest gentleman influenced the development of chess by forward looking ideas allied to relentless determination and brisk efficiency”. Maybe we may at least claim a certain determination and briskness in our K.O. matches. For sure we appeared, at times, to lead a charmed life in these two competitions . In the C&DCL K.O. round 2, Rokas Valantinas’ incredible rear-guard action in our match against Wrexham will live long in the collective memory of those who were there. Rokas had fought back from a dreadful position to secure the winning point in a tense time scramble which took the game just a few seconds short of the 3 hour session. Equally nerve-racking for the assembled players and spectators was the finish of the Wirral Chess League K.O. final: Steve Connor had turned down a draw in what appeared a somewhat dicey position earlier in the match but was left needing a win for Chester to lift the trophy from a position which had rather headed downhill ; miraculously Steve escaped a mating net by running up the board with his king which helped deliver a mating net at the other end. This victory was more leisurely with the best part of a minute left in the session. It is early days of course but already the C&DCL shows Chester teams not having matters all their own way this season.. they, with us, are surely looking forward to a another year enjoying the struggles of our great game. Phil Crocker and Ben Roberts were joint winners of the Coleby Cup, scoring 4.5/5 each. The competition was ran as a five round swiss during the off season. Congratulations to both.